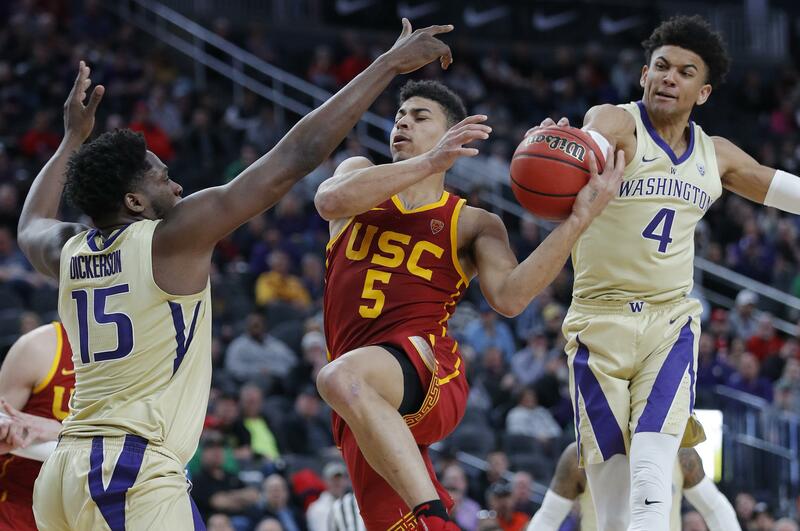 The Washington Huskies star edged out finalists Duke’s Zion Williamson, Zion Williamson, Gonzaga’s Brandon Clarke and Virginia’s De’Andre Hunter. Williamson, the Naismith national player of the year winner, may have been a fan favorite for the defensive player of the year award due to his popularity as the prospective No. 1 pick in the upcoming NBA draft. And Hunter claimed National Association of Basketball Coaches Division I defensive player of the year honors this week. However on Friday, Thybulle swiped the Lefty Driesell Award that’s given to the nation’s top defender, which proved to be a precursor for the top defensive prize in college basketball. Ultimately, the UW Husky defensive ace overwhelmed his challengers with a preponderance of takeaways during a historic season. His 126 steals is tops among Division I players and broke the 26-year-old Pac-12 single-season record that was set by California’s Jason Kidd in 1992-93. And Thybulle’s 83 blocks ranks 11th nationally. Washington’s 6-foot-5 senior guard is the only player in the past 20 years to record at least 100 steals and 80 blocks. Thybulle, who tallied 3.5 steals and 2.3 blocks per game, is one of three players in the past two decades to average at least 2.0 steals and 2.0 blocks in a season, joining Duke’s Shane Battier (1999-2000, 2000-01) and Kentucky’s Nerlens Noel (2012-13). Additionally, Thybulle eclipsed Oregon State’s Gary Payton (1986-90) for the conference’s all-time steals record with 331 and tied Christian Welp (1984-87) for Washington’s career blocks record of 186. Thybulle is the first Pac-12 player to win national defensive player of the year honors. Thybulle, who averaged 9.1 points, 3.1 rebounds and 2.1 assists, helped lead the Huskies to a Pac-12 regular-season title, a trip to the second round of the NCAA tournament and a 27-9 record. “I’m just happy to represent this program on this stage because there are big things coming for the Huskies,” said Thybulle, who started every game during his UW career – a streak of 135 games. Thybulle’s collection of honors include: two-time Pac-12 defensive player of the year, Pac-12 first team all-conference, Pac-12 all-defensive team, Associated Press Pac-12 Player of the Year and AP All-America honorable mention. Published: April 7, 2019, 10:25 p.m.